In case you are in denial about the approach of autumn or in a coma, it’s time to wake up and smell the pumpkins. These orange egomaniacs are encroaching on summer like Christmas usurps Halloween, making their flaming debut earlier every year. I enjoy pumpkin pie and cookies as much as the next American who is addicted to sugary treats. And I love to light my spiced pumpkin Yankee Candle, pretending I have the ambition to bake pumpkin pie and cookies while sipping a Shipyard Pumpkinhead Ale. But this year I feel nauseated from this force-feeding of pumpkin flavored goodies. I’ve been an advocate for humble, less show-offy vegetables, and realized that the September stage is ripe for a change. 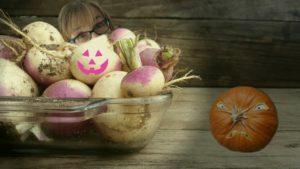 Move over pumpkins – there is a new vegetable that invested in acting lessons: the lowly turnip. I scored this exclusive interview with Miss Ruta Baga, the first turnip to earn her equity card. Don’t you think turnips are a joke compared to pumpkins? When I googled ‘Trump pumpkin head’ there were 1,050,000 hits compared to only 256,000 for ‘Trump turnip head.’ Pumpkins are aligned with Trump four times more than turnips, yet the same people photoshopping Trump’s face onto a pumpkin would rather wait in line at Starbucks and fork over $12 for a Pumpkin Spice Latte than taste a turnip. I rest my case. How do you answer the criticism that you are an all white vegetable? People forget how diversified turnips are during the summer when our greens are on the menu. This delicious delicacy is as nutritious as foul tasting kale that boasts about its superfood status. And Ruta is a Hebrew name that means ‘friend’ so we also represent a religious minority, extending the root of friendship to everyone we encounter. Some people say turnip doesn’t smell good enough to take center stage. What is your answer to this dilemma? Have you ever smelled the performance of plain pumpkin without the benefit of makeup and wardrobe? I didn’t think so. You can add cinnamon and brown sugar to a lima bean and elicit a standing ovation, so I know there is hope for the turnip. Do you think turnip can overcome its stereotype? I’ve heard rumors that turnip has been typecast forever into a supporting role, but how much acting ability does it take to sit on a porch with a candle shining through a crude cutout? For a turnip to go beyond the boiled dinner and become a headliner is a giant step for root vegetables, something a squash could never accomplish. How do you address concerns that you aren’t photogenic enough for the food industry? I admit a photo of a field of turnips doesn’t have the same impact as hundreds of pumpkins lounging on a hillside, but when you think about how hollow they are with all that stringy goo inside, the rosy blush of a turnip is quite attractive. And you can’t deny turnips are much more slender, fitting into Hollywood culture better than the chunky pumpkin. How can you displace the pumpkin in folklore and fiction? I didn’t fall off the turnip truck yesterday. I know there is a lot to overcome. Children feed on a steady diet of deception; thinking their baby brother or sister was found in a pumpkin patch, fearing a witch will turn them into a pumpkin, and watching Cinderella’s carriage transform into a pumpkin at midnight. To make matters worse, they watch Charlie Brown’s disappointment every year when The Great Pumpkin fails to make an appearance. With stories as sad and scary as these, I’m confident turnips can indoctrinate our youth with more positive tales enticing future generations to explore the unlimited commercialism of the turnip. Miss Baga called a halt to the interview, muttering something about an important meeting with Johnson and Johnson. She is negotiating a deal to introduce Turnip Spice Listerine breath strips into the market, providing a welcome reprieve from pumpkin flavored everything.